8 am - 8 pm daily. 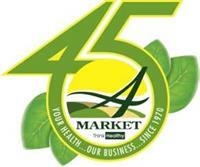 A Market: Family-Owned & Operated Natural & Organic Grocery Stores Since 1970. We are a second-generation, family-owned and operated, independent natural foods grocery with stores in Manchester, NH and Newport, RI. For over 40 years we've been partnering with our communities to make healthy choices and live a natural life. We love getting to know our customers and communities. Here's a bit about us, and we look forward to learning about you! It is our mission to help people on their path to wellness. We are committed to providing superior customer service. We are driven to fulfill this mission every day and stand behind it through our Grade ''A'' Pledge: To help you achieve wellness by providing personal interaction, ongoing education, and guaranteed satisfaction. Our customers deserve no less and A Market provides you with even more! A Market is committed to quality and consistency in offering the best possible choices available in natural, organic, specialty and locally produced grocery items. We provide a full service shopping experience dedicated to helping our communities live a life free of unnecessary ingredients and rich in pure, unadulterated goodness. Our buyers are constantly working to fine tune our product selection to help our staff, customers, and their families lead healthier and happier lives. Our knowledgeable and friendly team is here to assist you in any way. Come shop at our store and find out what we're up to, and introduce yourself. Serving our community with healthy foods and more since 1970. Conveniently located off of South Willow St. We are on Loring St. and have plenty of parking.